Janet Montgomery is one of the stars of the new NBC tv show 'New Amsterdam' and on Monday(September 24th) she attended a special preview of the show at The Paley Center for Media in New York City. 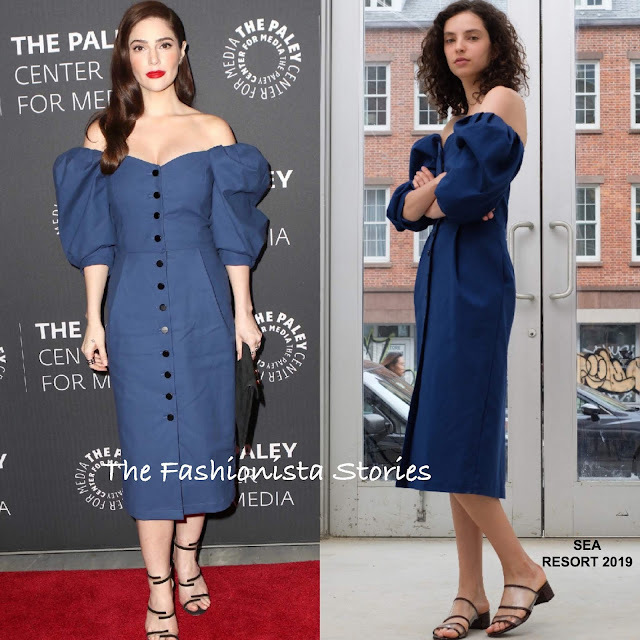 She hit the red carpet wearing the SEA RESORT 2019 'Lennox' blue off-the-shoulder pencil dress, featuring on trend short puffy sleeves, a ruched back and a center front button closure. While I like the M2MALLETIER black velvet, envelope clutch, something a little smaller would have been ideal. Her red lip added a bold, edge of color to her look which was topped off with side parted tresses, SLIGHT jewelry and SERGIO ROSSI sandals.